Meet Enrique “Kiké” Hernandez of the Los Angeles Dodgers. The 24-year-old Puerto Rican is currently a utility player for the Dodgers. What’s a utility player? A player who can play several positions and fill in wherever (and whenever) he’s needed. “Yo soy como el Bugs Bunny de la pelota,” jokes Hernandez about his versatility. And he’s kind of a maniac. Last season, he dressed as a banana in the dugout…during a game. Hernandez and his teammates began to embrace the banana. And so did Dodger fans. Hernandez says he had two fruit companies that sent him banana swag, including a bright yellow banana suit and a banana jacket. So, during an extra inning game against their bitter rival — the San Francisco Giants — Hernandez was asked to put on a banana jacket by Dodgers president of baseball operations Andrew Friedman. When Hernandez told Friedman he’d be fined for wearing the jacket in the dugout, Friedman responded that he would pay the fine. “Gotta do what the boss says,” said Hernandez to Inside The Dodgers. If you're not having fun while you're doing it, then you're doing it wrong! S/O to @vengatti for keeping my pre-game ride on point for the playoffs! And he lip syncs to Justin Bieber. Where does Hernandez get all that energy? He said he’s had it since he was a young pelotero in Puerto Rico. Hernandez told the TV show “Paparazzi Boricua” that his father once said Americans wouldn’t like his off-the-wall behavior. Hernandez responded that he couldn’t be anyone but himself. Plain and simple; RALLY BANANA!!! ?? And teammates, even the ones annoyed by his behavior, appreciate it. What do you think of the rally banana? Click on the share button to share this story with friends! Spring time is here which means more sun and the start of the a new baseball season. Bring out the baseball cap, the crazy stadium food and the sunscreen. Every delicacy you can think of can be found at El Mercado de San Juan. Think of it as “El Mercado de Las Carnes Exóticas,” where you can dine on bison, lion, rabbit and more. They also offer fresh fruits and vegetables, a variety of cheeses, fancy baguette sandwich stands and coffee kiosks for a caffeine boost while you shop. But if you’re looking for just some ol’ fashioned enchiladas verdes, look no further than Adela’s comida corrida. ¿Se te antojas comida orgánica? This little spot in the Condesa neighborhood offers just that. Their “guanábana-deli” sandwich has four — FOUR — kinds of cheeses and a special salsa made with guanábana fruit, almonds, spinach, cilantro and chile de árbol. They also sell cute bottles of salsa that make for good recuerditos for your jealous friends back home. 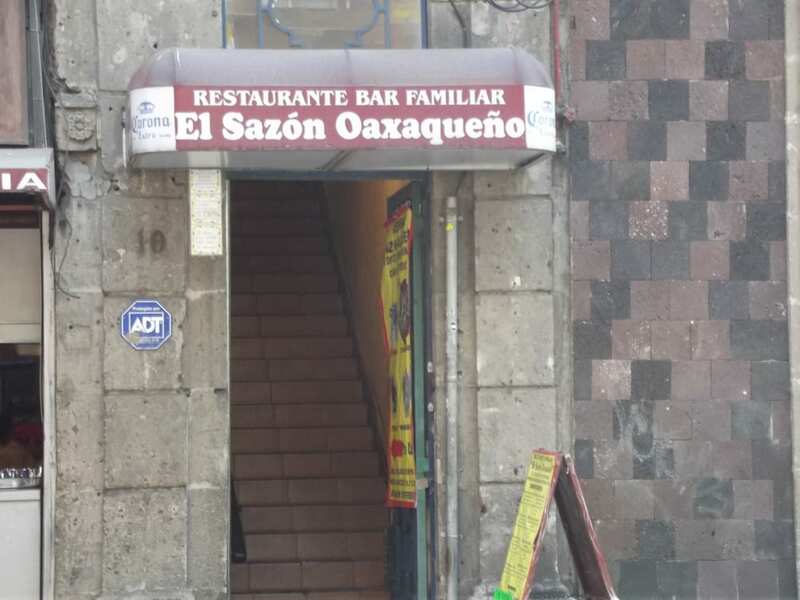 Credit: Yelp / Fernando N.
Don’t be fooled by the mysterious storefront, El Sazón Oaxaqueño is a special place with enormous dishes en el estilo Oaxaqueño, including lots of dishes made with nopal and delicious Oaxacan cheese. We recommend that you go during breakfast and get the chilaquiles; they’re real cheap and made with lots of love. In the depths of the Alameda neighborhood, behind a heavy black curtain lies Bósforo, a mezcaleria known for its on-point DJ, superb mezcal menu and some tasty antojitos. Spend an afternoon wandering around the Mercado Roma, an indoor market with dozens of artisanal options from Japanese tacos to grasshopper bonbons. It’s a terrific place to spend a rainy day…and extremely Instagram-able, if that happens to be important to you. Located a few blocks away from El Zócalo, Pastelería La Joya isn’t only a great bakery, it also happens to be one of Mexico City’s best greasy spoons. Order the chilaquiles con pollo y huevo, it will be the best $2 you’ll ever spend. Bonus: Here’s a lovely video that shows treats being prepared at La Joya. A lively 24-hour, diner-style restaurant in the heart of el Centro Histórico, Café La Pagoda has been around for ages. Although the name might throw you off, it does indeed serve Mexican fare. All meals are made with super fresh ingredients. Pro tip: The way the waitresses make café con leche is a performance you don’t want to miss. Pulque, as some say, is the Aztec version of beer. It’ll take a lot for this fermented beverage to get you drunk. Downtown, Las Duelistas, serves it up right. Plus, they feature live music as an extra treat. Where do you go to eat and drink (and eat and eat and drink and drink) in CdMX? Let us know; we’re hungry.